You can now control any TC Helicon vocal effects processor with the MCA100 Mic Control Adapter. This compact unit connects directly to most dynamic microphones. It features a single-switch cycle preset, and a blue LED for accessibility in low-lighted rooms or dark stages. The MCA100 passes through your processor presets without sacrificing your performance. TC Helicon guarantees that your MCA100 is ready for any roadshows. It is made from durable materials, ensured to survive gigs after gigs. WORKS WITH THE LATEST TC HELICON PROCESSORS - The MCA100 Mic Control is compatible with all, including the current, TC Helicon vocal effects processors. READY FOR ANY GIGS - This mic control adapter is made of lightweight and solid road-ready materials. Plus, TC Helicon included a blue LED under the MCA100's button so you won't have a hard time finding the magic button under dark stages. XLR CABLE THAT ISOLATES NOISES - The Blucoil Audio Balanced XLR Cable composes of 24AWG wires and 98% braided shield that effectively blocks EMI and RFI noises in your signal. HASSLE-FREE CONNECTION - Blucoil's XLR M to XLR F cable easily connects microphones to recorders, preamps, records, mixers, and audio interfaces. INCLUDES - TC Helicon MCA100 Dynamic Microphone Control XLR Adapter for TC Helicon Vocal Processors. 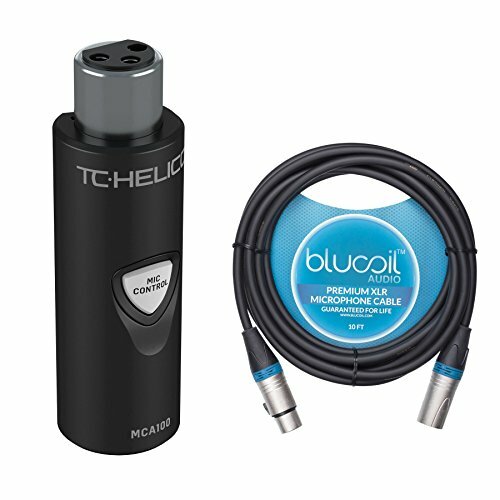 Blucoil Audio 10 Feet Balanced XLR Cable - Premium Series 3-Pin Microphone Cable, Speakers and Pro Devices.